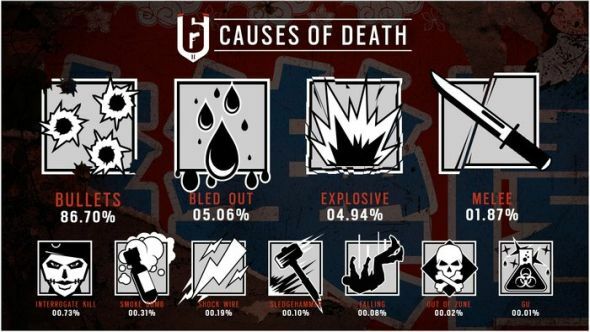 Ubisoft have published an infographic documenting the causes of death for Rainbow Six Siege players. The data comes from deaths throughout Operation Blood Orchid, which ran from September 2017 to December 2017. Here’s everything we know about Rainbow Six Siege Year 3. Somewhat unsurprisingly, the vast majority of deaths come from bullets, which killed 86.7% of players during Blood Orchid. Way behind, the contest for second and third place was relatively close; 5.06% of players bled out, while just behind, 4.94% were killed by explosions. Just under 2% of players were killed by melee attacks. After that, the focus moves to slightly less conventional ways of getting kills, gradually increasing with rarity as the list goes on. Around 0.73% of deaths came from Caveira’s Interrogation skill, while roughly one in every 300 kills came from Smoke’s Remote Gas Grenade, while less than 0.2% came from Bandit’s Shock Wire. Sledge’s hammer nets around one in every 1,000 kills, while about 0.08% of player deaths came from falling. Even more amusingly, about one in every 5,000 deaths comes from players going out of bounds, which is something PCGamesN’s resident Rainbow Siege experts didn’t even know you could do. Rounding out the infographic is Gu, Lesion’s toxic mines that damage players over time, which one in every 10,000 (or 0.1% of) deaths, occur to. You can see the full infographic on Rainbow Six’s Twitter.